Wayward Wine leaves the steely, urban clutches of Vancouver for a trip east along the Fraser River to Fort Langley and Fort Wine Co. After a drenched drive through faded countryside, we arrive in the adorable town of Fort Langley. Then we accidentally drive through it and onto a First Peoples’ reservation. The road turns to gravel and we turn back. After coffee and smoked salmon (when in Rome), we head to the Fort: home of the Hudson Bay Company’s western operations. Curly peels spiral off the plank. 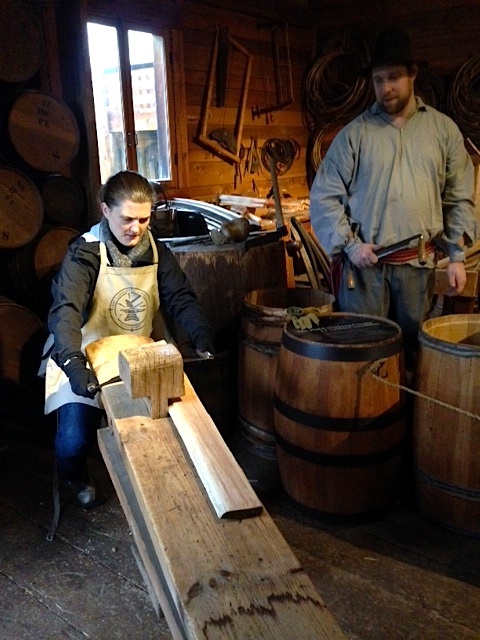 But instead of wine, these barrels brought endless tons of salted salmon, oddly, to…Hawaii (19th century Spam?) and beaver pelts to a top hat hungry England. Our cooper then transforms into a blacksmith and hammers us a coathook. We learn that he came from Quebec, became a barman in Vancouver: famed “no fun city” (because happy hours were illegal, bars closed at midnight, and alcohol cost double), then he worked as a forest guide, park guide and finally full time fort guide. (The only original building is the nearest white one). 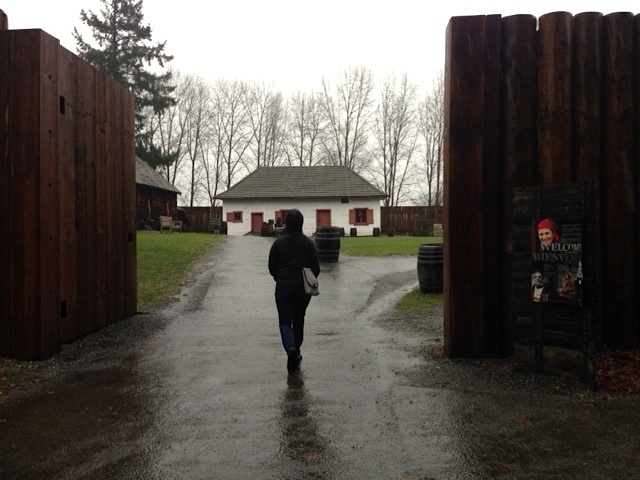 When British Columbia lost, well, the Columbia River to America, the Hudson Bay Company shifted to Fort Langley. 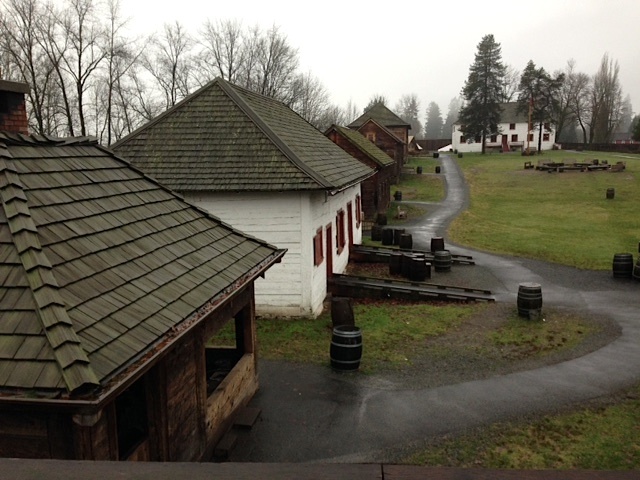 Our earlier visits to Fort Vancouver in Washington made sense of this outpost (and that BC’s Vancouver is also called Vancouver). After a few more hours of history, artifact handling, and a lame 90’s promo video, our stomachs lead us back to town. Leləm’ Arts and Cultural Cafe fills us with the most fantastic buffalo reuben and bison sandwiches imaginable. This modern, wood-beamed and glass café sits on the boardwalk. A tribal daughter of the Fort’s interpretative basket-weaver owns it and features native arts and fusion foods. Next we leave for Fort Wine Co. After a decent, wet drive through flat even wetter farms, we find a tidy, new building faced like a western trade depot. Thankfully someone waits, bored, to taste us. Wade Bauck, tugboat captain and cranberry farmer started making fruit wine in 2001. 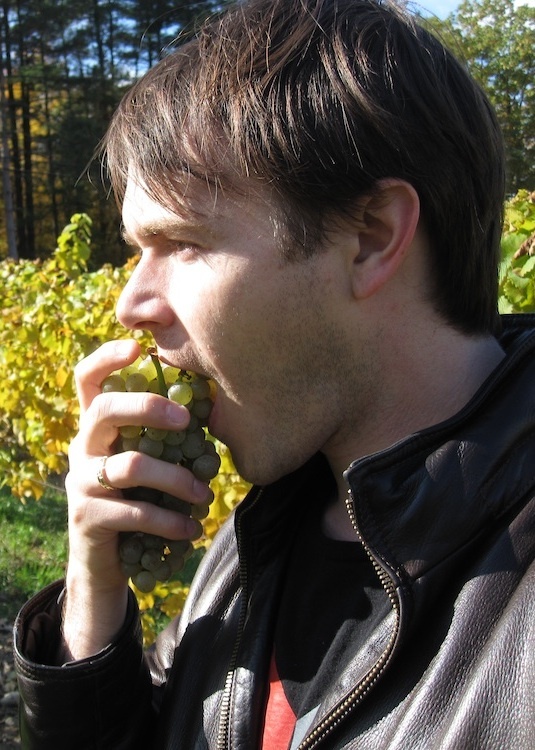 Today, young Toby Bowman runs wine-making, sourcing fruit from local farmers as well as their bog. He floats between texting, clock-checking, to answering our questions, while our guide stays involved as possible. We start with their cranberry wines. Ghost of the Bogs comes from Fort’s own pre-verizon, white skinned cranberries. It looks pale lemon, feels dry, mouthwatering, and lean, and smells and tastes of pith, citrus, and white melon. It’s basically a fudge, since BC requires wineries to produce a certain amount. Yet it works surprisingly well (4 of 5) like a tart Chenin Blanc from the Loire. 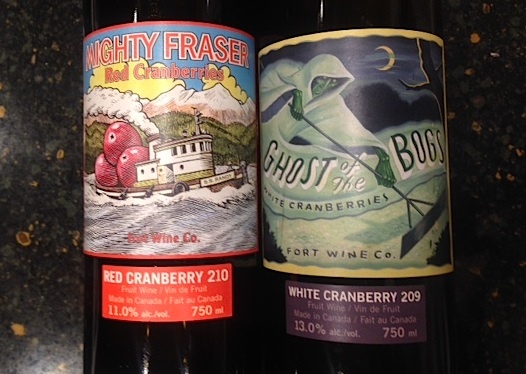 Fort’s Mighty Fraser’s Red Cranberry 2010 looks a clear, light ruby, with a sliver of sweetness that tames oodles of acid, some body, and aromas and flavors of, well, cranberry. But nothing like that sauce at Thanksgiving. No, this is zippy, fruity, and a touch saline and quite good (4 of 5). Valley Girl Blueberry wine is fine, sweeter, perfumed, bulbous, and a touch too tannic but tastes of blueberries and its oak: fine (3 of 5). Their strawberry wines look and taste a bit oxidized, seedy, and too sweet: like decent fruity sherry (2 of 5), but I don’t think that’s their goal. The range of fortified desert “Saucy” Cranberry, “Finger Fruit” Raspberry, “Sweet Nothings” Blueberry etc. are very sweet, warm, and cloying. Their acidity saves them, but faults creep beneath their sugar and upper teens alcohol (2 of 5). The oak aged “Ilse Queen” Blackberry tastes passably like port (3 of 5). A mostly sweet-toothed consumer base clearly loves these. Regardless of some misfires, Fort Wine Co. makes the best, dry, berry-based wine we have had in a while (and that includes Maine, Rhode Island, New York, Quebec, Washington, and Oregon). Heck, they’re even vintage. Maybe thanks is due to Christine Leroux, who consults them (a DNO at Bordeaux U., time in Australia, at J. Lohr, Inniskillin, St-Hubertus, and teaching in the Okanagan doesn’t hurt). Their pricing from $12 to $20 also works. Either way, well done. This entry was posted in Uncategorized and tagged bc, british columbia, Canada, cranberries, cranberry wine, Fort Langley, Fort Wine Co., Fraser Valley, Fruit wine, wine. Bookmark the permalink. The BC Gov’t expects how much wine to be produced? Are their regulations more controlling of the vintner than U.S.? I forget the figure they mentioned. BC is more concerned with quantity as a winery, it’s different than our AVA reqs (which are more like Canada’s VQA reqs).